This Whitsunday islands sailing itinerary is subject to weather conditions. The chosen anchorages are suitable for winds South/South East – 10 to 15 Knots. Or follow one of our suggested sailing itineraries based on either South/South East Winds or North/North East Winds. These itineraries will help give to you an idea about time and distance between anchorages, as well as insight into the many places you can visit and things to do around the Whitsundays Islands whilst chartering your own boat. Please note that this is a guide only and is subject to current weather & tide conditions – remember to stay flexible when chartering, you never know what you might discover! After your introductory briefing: departing Abell Point Marina it’s a short 2.5 – 3 hour sail past Pioneer Point and across the Whitsunday Passage to your first nights destination at Nara Inlet on Hook Island. Motor down the long narrow fjord for your overnight anchorage. It’s then a short ride in the tender to the start of a walking track that leads from the beach to Aboriginal Caves. There is also a waterfall which runs after heavy rains. The cave painting site is protected by a fence to keep out the wild goats that inhabit the island. looking inside the cave admire the primitive paintings indicating that aboriginal people lived here until recently. Surrounding the walk are a variety of tropical palms and majestic Hoop Pines. There are also views out looking down along the inlet framed by the surrounding trees. Sail through the Hook Passage and away from Whitsunday Island heading east towards Border Island. Cateran Bay on Border Island has some exceptional snorkeling opportunities and a walk from the beach up to the top of the “saddle” through grass trees to panoramic views of the island and surrounds. After lunch, sail North taking in the magnificent contours and headlands of Hook Island, carefully navigating the rocks around Pinnacle Point to your choice of the bays on the north end of the Island. Our recommendation is Butterfly Bay, where, if you are not completely snorkelled out there are yet more snorkel opportunities in this sheltered anchorage. It’s a short sail from Butterfly Bay to Blue Pearl Bay on Hayman Island. Blue Pearl Bay offers more amazing snorkeling with an abundance of fish and corals – some of the best to be seen around the islands. There is plenty of time to enjoy the marine life, beach and the walk up to the hill to Dolphin Point Lookout; your evening anchorage is less than an hours sail away. Later in the afternoon, sail past the 5-Star luxury resort on Hayman Island on the way to Stonehaven Anchorage to pick up a free public mooring, to view another amazing sunset and settle in for the night. No need to set the sails this morning, it’s less than 30 minutes motor around Bird Island to safely navigate to Langford Island Reef. Being so close means you can arrive early, get yourself a mooring and enjoy the beach before any day trips from the mainland arrive. Enjoy lunch, take your time having a snorkel and a stroll on the sandy beach before heading approx 1.5 hours sail to Macona Inlet for the night. Take in the views as you make your way South passing Cid Island and Henning Island en-route to Hamilton Island Marina. Fill up with water, provisions and let someone else do the cooking! There are plenty of things to do on Hamilton Island. Hamilton Island is a modern resort Island with a village that has all the essentials-bakery, bottle shop, general store, chemist, local art, fashion and plenty of restaurants to choose from. Hire a golf buggy to explore the island and end your day by watching a glorious sunset from the lookout. Leave Civilization in your wake and head off in search of solitude on Shaw Island. Spend a leisurely day sailing past Lindeman Island (Boat Port, Gap Beach and Plantation Bay). Once anchored for the night at Burning Point anchorage, Relax. Enjoy the unspoiled natural beauty of the surrounds. Sit back for the evening soaking up the peace and quiet. Lots to see today as you sail past Pentecost Island and through the Solway Passage to some of the Whitsundays most iconic locations. 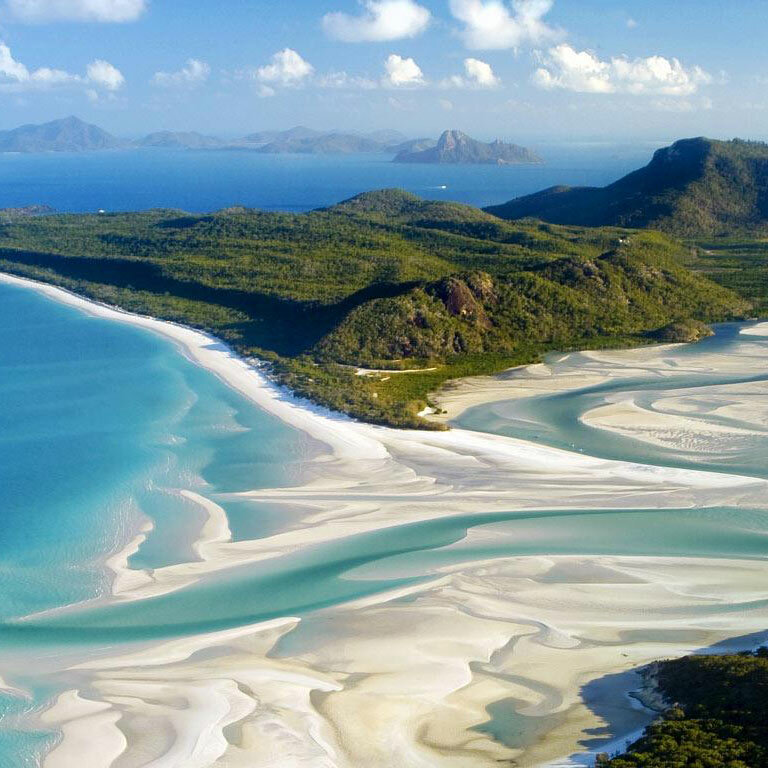 Take a walk along Whitehaven beach and a lunch time picnic. The beach is more than 5 kilometers of sparkling white sand made up of 98% silica a legacy of a geologic era when the sea level was lower. Take a walk up the beach and the only sound you hear is the sand that squeaks beneath your feet and the gently breaking waves. There are no resorts, no buildings, just natural beauty. At the northern end of the beach is Hill Inlet and Tongue Point, it’s short sail/motor around tongue point to your overnight anchorage in Tongue Bay. A short tender ride (tide permitting) to the start of a walk the leads to the lookout overlooking Hill Inlet. Once ashore it is just 650 meters to the platform lookout with a magnificent view straight into Hill Inlet where the sands just beneath the water swirl to give incredible contrast. Sail north following the coastline of Whitsunday Island, passing Dumbell Island. Sail through the hook passage between Hook and Whitsunday Island then head to Cid Harbour – Sawmill Beach where you will spend the rest of the day. A walking track from Sawmill beach leads to the summit of Whitsunday Peak. The track is a strenuous 2.5km (437m climb) so take plenty of water, ankle supporting footwear is recommended as part of the walk is along a dry creek bed, 4 hour round trip. Alternatively a more sedate 1.5km trail takes you around the point to Dugong beach. Enjoy a leisurely breakfast then make your away west towards the Molle Islands. Bauer Bay on South Molle Island for your final night on the water. South Molle Island features 6 walks of various lengths and offers spectacular views of the surrounding islands and nature. It’s only a couple of hours sail from Bauer Bay to return to Charter Yachts Australia base at Abell Point Marina. You can shorten or extend this route to create the perfect holiday for you. Use our Whitsunday Anchorage Guide to help you plan the things you want to see and do during your sailing trip to the Whitsunday Islands.